Spectra Energy's latest earnings proved it isn't impervious to the oil crash. Find out what long-term investors need to focus on over the next two years. To say times are tough for energy stocks is an understatement. Even some midstream MLPs, despite their tollbooth-like business models and fee-based contracts, are finding it harder to raise growth capital and trimming payout growth guidance. On the other hand, there's Spectra Energy (NYSE:SE), and its MLP, Spectra Energy Partners (NYSE:SEP), which, though feeling the effects of the energy price crash, are resiliently plowing ahead with one of the most ambitious growth plans in America. Here are three key facts about what's ailing Spectra and whether it might be enough to derail the company's plans and enrich dividend investors in a world of much lower commodity prices. Tough year for Spectra Energy Corp.
Sources: Spectra Energy earnings releases, 10-Qs. Spectra Energy Corp. has had a much worse year than Spectra Energy Partners. Three out of its four business units faced declining earnings, because of two key factors. Source: Spectra Energy earnings presentation; author's chart. One major contributor was the nearly 15% year-to-date rise in the U.S. dollar relative to the Canadian dollar. That currency difference negatively affected its Union Gas (the second largest natural gas distributor in Canada) and Western Canada segments. 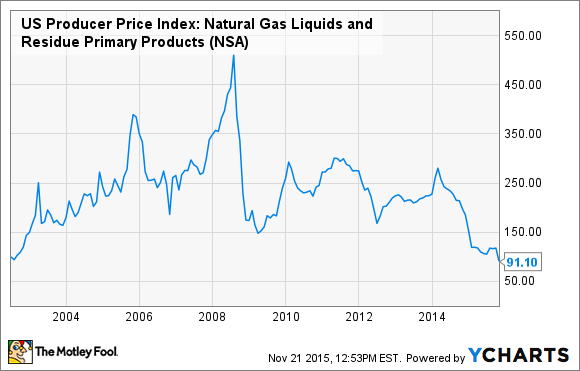 Another negative factor was falling natural gas liquid (NGL) prices, which is the result of a massive supply glut. NGLs are produced both from natural gas and alongside certain kinds of oil, so the oversupply of both commodities has driven NGL prices to their lowest level in well over a decade. This trend hurt Western Canada through its Empress NGL production and fractionation plant, which saw much lower prices for its product. However, this quarter's 53% year-over-year decline in NGL prices hurt DCP Midstream Partners (NYSE: DPM) the most, the nation's largest NGL producer (via fractionation) and third largest transporter. Spectra Energy Corp. is co-general partner and manager of DCP Midstream, along with Phillips 66 (NYSE:PSX). Things have gotten so bad for DCP that Spectra Energy and Phillips 66 recently had to team up for a multibillion-dollar rescue effort to secure DCP's distribution and thus its flow of fees to its sponsors. Meanwhile, the reason Spectra Energy Partners proved immune to this year's energy-price decline is the same thing that makes both it and its general partner such great long-term income investments. Sources: Yahoo! Finance, Spectra investor presentation. Despite Spectra Energy Corp's troubles, both it and Spectra Energy Partners have highly secure payouts that are likely to grow substantially in the next few years. That's because both Spectra Energy Partners and its Spectra Energy's business models are focused on long-term-contracted, fee-based revenue. For example, Spectra Energy Corp. expects 99% of EBITDA generated between 2015 and 2017 to be fee based and largely immune from commodity prices.Similarly, Spectra Energy Partners' cash flow is almost entirely based on reserved volumes and is insensitive to energy-price fluctuations. Ongoing negative currency effects may still end up dinging Spectra Energy Corp,'s profits, but those should be more than offset by the massive volume of new projects that both it and Spectra Energy Partners plan to put into service by the end of 2017. Source: Spectra Energy investor presentation. Spectra Energy has $8.4 billion in already contracted, fee-based projects scheduled to enter service over the next two years, which are expected to increase annual EBITDA approximately 37%. Around $6 billion of those projects will be funded and managed by Spectra Energy Partners, which is expected to see its annual EBITDA grow by 45%. Meanwhile, Spectra has over $20 billion in potential growth projects it's discussing with customers that, if contracted for and completed, would result in impressive growth far beyond 2020. Thus far, the worst oil crash in a generation has only dinged Spectra Energy Corp.'s earnings, mainly because of the weakening Canadian dollar. However, Spectra Energy Partners' fee-based tollbooth business model remains almost entirely unscathed. Spectra Energy Corp. may continue to face substantial challenges should energy prices fall further or stay low for years. This situation would probably further weaken the Canadian dollar, which could substantially harm its earnings. However, the massive fee-based organic growth pipeline coming online through 2017 should still ensure that both Spectra Energy Corp. and Spectra Energy Partners' payouts remain highly secure and growing nicely for at least the next two years.